Google Home launches in the UK on April 6th | What Hi-Fi? Google Home, Google's voice-controlled wireless speaker, is coming to the UK. The speaker goes on sale April 6th and will cost £129. Following its US launch back in October last year, Google Home has finally been announced for the UK. The voice-controlled wireless speaker uses Google Assistant to do your bidding. Simply say "Okay Google" to get the conversation started. If you happen to have a Google Chromecast or Chromecast Ultra dongle connected to your TV, you can use Google Home to send voice commands as well as control playback and access content on appls like Netflix. 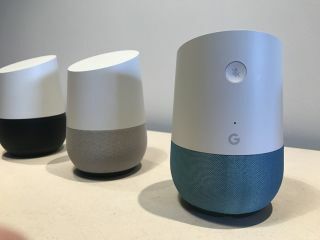 You can connect an unlimited number of Google Home speakers to create a multi-room system, which is something you can't currently do with its closest rival, the Amazon Echo. For the UK launch, Google has teamed up with various UK content partners for news and music, including the BBC, The Sun, The Telegraph, Google Play Music, Spotify, TuneIn and BBC Radio. To help customise your speaker, there's variously coloured fabrics (£18) and metal bases (£36) to choose from, all of which will be available to buy through the Google Store. MORE: What is Google Chromecast? What speakers and TVs are supported?